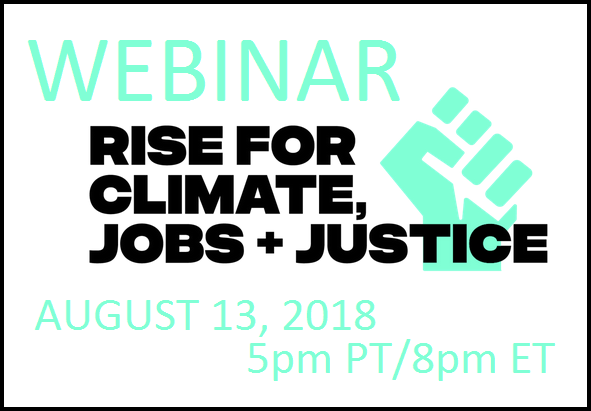 The Webinar Ready to Rise National Call will take place on Monday, August 13, 2018 5pm PT/8pm ET in advance of the Rise for Climate, Jobs, and Justice that will take place on September 8, 2018. 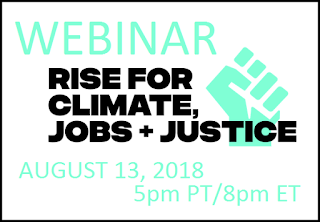 At this webinar you will hear from some of the inspiring grassroots leaders who are leading actions and events on September 8th. This conversation will get you ready and up to speed on everything that's planned for this global day of action and beyond. As explained in an email by Sam Read, Digital Director, Peoples Climate Movement, "To change everything, we need everyone - that means you." Time. This webinar will give participants an idea of what the Rise event will actually look like. At the Ready to Rise National Call to hear from a few of the event organizers about what’s being planned across the country, and opportunities to get more involved. A demonstration in Miami, FL, a solidarity event with workers in Joliet, IL, a candidates forum in Denver, CO, a huge march in San Francisco, CA, and so much more. You can hear about these events and more on the Monday webinar call. Together, we’re building the momentum we need to pressure our elected officials to commit to a clean, sustainable, and just future. To RSVP for this Webinar click here. If you can’t make it, but don’t want to miss it, RSVP anyway and we’ll send you the recording after!